rotherham business news: News: Rotherham school's enterprise education "firsts"
News: Rotherham school's enterprise education "firsts"
Wath Comprehensive School in Rotherham has scored two "firsts", being the first school and having the first teacher to achieve new enterprise awards in Yorkshire. 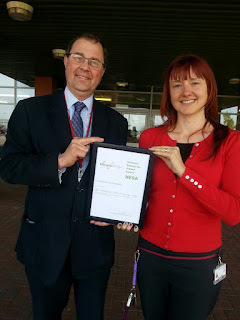 The school has recently achieved NESA (The National Enterprise School Award) recognition and the school's enterprise coordinator and languages teacher, Jen Wall, has been recognised with a National Enterprise Teacher Award (NETA). The school is part of the Enterprise Adviser Network and started undertaking the quality awards as part of their strategy to develop and quality assure their provision. John Marsden, Head of Careers at Watch Comprehensive School, said: "It's important to us that young people at Wath have a range of enterprise learning opportunities, inside and outside of the curriculum, that support them to develop the skills and qualities needed in the world of work and business and to inspire them about careers and industries in the region. Achieving these two awards is not only fantastic recognition for our approach in school and Jen's hard work personally, it has also been a valuable process which has supported us to reflect on where we are, and plan for the future." Gary Durbin, Head of Enterprise Village and developer of the national awards, said: "The submissions were really strong and demonstrated the breadth and depth of what was being achieved in terms of enterprise practice and provision." The national Enterprise Advisers programme, sees volunteers from the world of work and business team up with schools to increase the quality and quantity of careers and enterprise learning for young people. The proposal builds on the considerable experience and success seen within several districts. For example, Rotherham schools have been fortunate enough to receive considerable support through the Rotherham Ready programme. Wath's enterprise adviser is Jo Hanman from Capita. She said: "It's great news for the school, and important for the students, staff and community to know that what's being developed is really good quality. It's a proud moment that they're the first in Yorkshire to get both awards!"